You can do all the programming and techniques you want to get a better life, but if you don’t love yourself, it will not change a damn thing. You will still feel the same way about yourself tomorrow and the day after that and the day after that. The bottom line is the most important relationship you will ever have is the relationship you have with yourself. This relationship can be a rewarding one when rooted in self-love, or it can be toxic when not. So, what is self-love? Why is it so important? And most importantly, how do you find it? • Discovering the transformational tools that are available within. • Learning how to use these tools to uncover what you really think and feel about yourself and the world around you, and more importantly why. • Transforming the wounded parts of self that have been separated from this love through practical steps and exercises for healing and forgiving the past. • Empowering yourself to make more loving and conscious choices about what you believe and therefore what you will feel and experience. We all are searching for more love in our lives. The Heart of the Matter not only shows you where to look but also gives you a roadmap on how to get there. Loss can either break you open or break you down—your choice. If you choose to allow it to break you open, you can discover who you truly were meant to be before time and the world made you forget. How Learning to Say Good-bye Taught Me How to Live is a narrative journal of the many spiritual lessons and gifts Joffre McClung received during a period of tremendous loss in her life and how they were put to the test during her best friend’s battle with cancer. It chronicles the close friendship they shared during this traumatic time and how they worked to stay conscious and move forward with their inner growth despite their pain. When we are asked to say good-bye to what was, we are offered an opportunity to experience what can be—if we do the work. Each chapter highlights the various inner battles as well as the gifts that are revealed during difficult times. The lessons include issues of control, judgment, needing to be right, forgiveness, self-love, receiving, and the power of our beliefs. The gifts include partnership with your Higher Self, true intimacy, the power of play and laughter, faith and patience, angel whispers, co-creating, and much more. At the end of each chapter is a list of questions and thoughts that aided the author to go deeper with the work. "The Heart of the Matter is sensational and unlike anything I have read before. Joffre throughout her book will share tips and tricks on how to self-love and improve particular aspects of your life. As I read The Heart of the Matter, I found myself being amazed by Joffre’s book and think she is an incredible woman for deciding to investigate the topics and share it with her readers so they can live happier more fulfilling lives. Overall The Heart of the Matter is an informative and poignant self-guide that can change your life and so I have no choice but to award this stellar read five stars as it is indeed one of the best self-help guides I have ever had the pleasure of reading." A concise, clear, and helpful workbook -Overall, this guide promises an enriching, enlightening self-discovery process. In this self-help guide, McClung (How Learning to Say Goodbye Taught Me How to Live, 2015) encourages readers to do “inner work” through meditation in order to facilitate spiritual healing.This short, intimate, and interactive guide aims to help the reader explore, through exercises, their own relationship with the “Higher Self.” The author explains that the Higher Self is always inside us, and it’s always capable of repairing the painful and repressed areas of one’s soul. An important first step, she says, is to develop a “safe space” in which to explore and access “self-love.” McClung provides techniques to expand one’s imagination to create a permanent haven for one’s inner work. She cautions, however, that although one may release pain and negative feelings through meditation, one’s practice shouldn’t end there: it’s important, she says, to finish meditation by replacing pain with love. At the end of each chapter, the author presents “Questions to Investigate” that will assist readers in finding other areas that may require healing. Readers are also encouraged to confront their own conflicts and hesitancies about meditation and other core concepts (“Do you believe everyone has a Higher Self?”). Such questions will help readers look inwardly instead of outwardly for sources of confidence, love, healing, and strength. McClung also urges readers to analyze their current relationships and investigate boundaries that keep them from accessing a Higher Self. For example, one question asks, “Who would you piss off by taking back your power and looking inward to your Higher Self instead of outward for love and wisdom?” These types of queries encourage an honest exploration of dependencies and relationship dynamics. The book also contains extensive exercises for identifying negative emotions, encouraging readers to honor such feelings rather than running from them. The Heart of the Matter offers a lifelong process for learning and acting from self-love. Joffre McClung’s The Heart of the Matter is a thoughtful, thought-provoking book that challenges individuals to live their lives anchored in the truth of self-love. Through interesting discussions, challenging questions, and daily meditations and affirmations, the book offers a course that anyone can take to find self-acceptance...The book contains powerful insights with a strong spiritual component, where reincarnation is said to return humans to earth to teach and to learn love. There is no particular religious dogma here, however, so the book’s practices can be used by anyone, regardless of their systems of belief.The questions posed are often challenging, and some are quite potent: “Have you ever considered that God, knowing you have been fully equipped for your journey, wants you to wake up to your power and to use that power to rescue yourself?”Though full of wisdom, the information here does not represent an easy fix in learning self-love. Instead, it offers a method to allow each individual to continually address their own emotional well-being.Much of what the author suggests, such as the need to reprocess childhood emotional wounds, will be difficult work and may even feel counterproductive. However, McClung asserts that old wounds must be healed rather than ignored, even—and maybe especially—when they are uncomfortable to process...The Heart of the Matter offers a lifelong process for learning and acting from self-love. Insightful and well written, this book contains wisdom for creating habits that lead to happiness and fulfillment. Having read the beautifully written and deeply moving ‘How Learning to Say Goodbye Taught me to Live’ I was looking forward to Joffre McClung’s latest and I was not disappointed. Once again the author serves as guide, counselor, and teacher on a journey of exploration that this time focuses on the love of self that we all seek in order to thrive, grow, and succeed in life. This insightful book strongly confirms that McClung is here to stay as a significant mentor to those seeking clarity of the mind and guidance of the soul. The Heart of the Matter: A Workbook and Guide to Finding Your Way Back to Self-Love by Joffre McClung is a groundbreaking work in the area of personal development and success, a book that offers readers the one important thing they need to succeed in personal life and in business. There have been a lot of books on achieving success and personal transformation, but many of such books talk about techniques that readers can use to get where they want to be - some of these include changing their mindset, practicing the law of attraction, and many others. In her no-nonsense style, McClung challenges readers to do the one hard and essential thing that guarantees success - to love themselves.Filled with powerful insights and exercises, this book combines traditional Eastern philosophy with Western thought to guide readers on the path towards self-actualization. Articulating with confidence, the author unveils what readers need to do to fully become present in themselves, embracing themselves, and redefining their dreams. This book will help readers to develop a positive and powerful relationship with themselves because every journey towards success begins at home.I felt different — extremely different — after reading this book because it contains the message I needed to hear. We have been taught by some teachers to feel guilty about loving ourselves, something seen in popular quarters as selfish, but the author opened my eyes to the truth that any love flows from the love we have for ourselves and that it is important to invest in who we are. 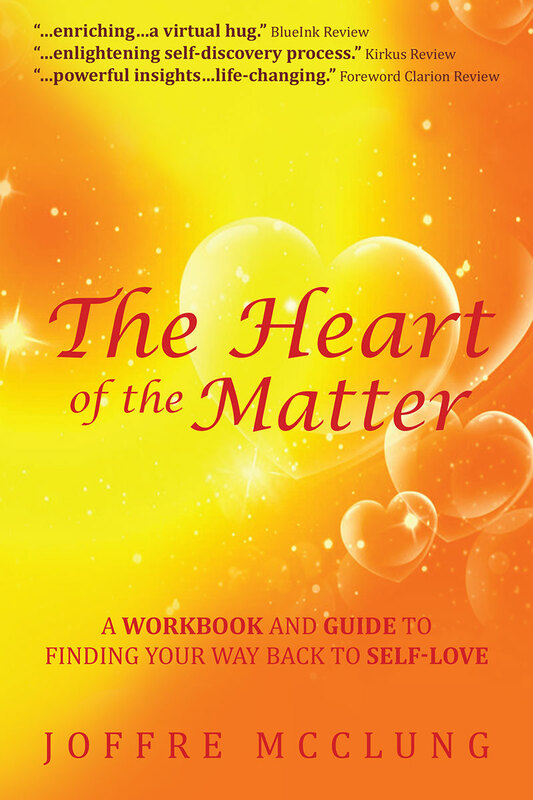 The Heart of the Matter: A Workbook and Guide to Finding Your Way Back to Self-Love is a compelling message that will set readers on a new path of hope, a gift that must be passed on. Can’t recommend it enough! McClung muses on the spiritual insights learned during the last six months of her best friend’s life in this debut memoir.When McClung, just emerging from a two-year grieving process over her mother, found out that her best friend, Rob, had stage 4 breast cancer, she vowed, “I would not lose myself in grief again.” In this journal, the author, who had left a New York City media career to take care of her mother in Texas, shares the spiritual journey that she and her friend traveled during the last six months of Rob’s life. McClung notes that while they “had had disciplined spiritual practice for the past thirty years,” Rob had “kept her Higher Self” at arm's length. After Rob’s partner died suddenly, and then her mother a few weeks later, McClung convinced her to move from Los Angeles to Texas to spend her final days with her father and brother, whom she had not seen in 22 years. The two women encountered what they termed “out of the blues,” appearances of “angels” (including a friend named Gabriel) that made this transition more bearable. By memoir’s end, Rob makes her “crossing,” but not before admitting that she finally felt loved during a family Christmas celebration, an event that McClung, who gave her friend necessary space during this time, did not part take in. The author ends each chapter with resonant questions for readers to ponder. McClung has written a thoughtful think piece that also serves as a touching tribute to “one of my greatest teachers during the worst times of her life.” The questions the author presents readers arise appropriately from her narrative and also have universal relevance, including “When is the last time you said you were sorry to yourself or another?” McClung offers many well-sketched, even funny, anecdotes, including her “outburst” in Target by phone with Rob about buying her outfit.Heartfelt reflections on the lessons and strength to be gained from grief and loss. How Learning to Say Goodbye Taught Me How to Live is a heartfelt memoir by Joffre McClung, which follows her as she says goodbye to her dear friend Robbyn, who is dying of cancer. We not only experience the intense emotional bond between two best friends but benefit from the spiritual insights offered by McClung's keen observation of this journey from a spiritual standpoint. The book is full of wisdom that helps us to deal with life's painful episodes and learn to grow spiritually from those experiences. Kudos. 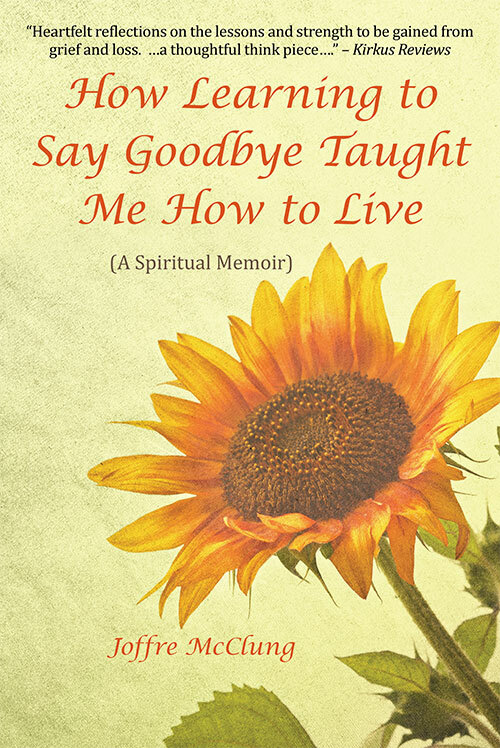 How Learning To Say Goodbye Taught Me How to Live is an excellent book by Joffre McClungwhich addresses a range of subjects such as grief, loss, coping with financial troubles, andbuilding inner spiritual strength. It is an account of real life events leading up to the death ofher best friend, Rob, who was diagnosed with cancer. Although Joffre has intense emotions,she is determined that Rob will heal and cross over in a humane and more fulfilled way.As the story unfolds, I was transfixed by the number of difficulties they went through, andhow bravely and wisely Joffre supported and advised her friend. The book consists of twenty-six chapters, each of which contains new developments, spiritualwork, and a clear lesson which is highlighted at the chapter end. Also, each chapter listsquestions to encourage people to think more deeply about their own lives. The lessons areoriginal and very candid, and they indicate how deeply spiritual and transformative theexperience has been for the author. Through dedicated spiritual work, the author has gained adeeper and richer insight into human emotional and spiritual nature. Joffre has taken a lot of support from her higher self to understand the problems she faced.With due diligence, reflection and meditation, she discovered wisdom within and supportedher friend, Rob. Examples of the topics addressed in the lessons she learned are: regarding theego, feeling and understanding one's emotions and beliefs, understanding and connecting tothe higher self, forgiving oneself, being grateful, avoiding making decisions for others,experiencing the liberating power of love, and other ways of honoring the sacred journey of life.The fundamental truths which Joffre has shared with the world are very transformative andempowering. This book is very moving and lucid and has a lot of practical advice forpeople struggling to overcome any problem in life.